Ham Lake, MN is a booming town just north of the twin cities, not far from Blaine and Andover, MN. Ham Lake is a charming hometown with loyal customers that have trusted their belongings with us for years! 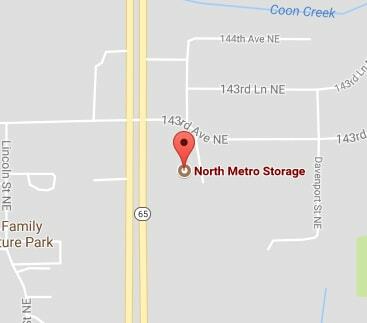 North Metro Storage is centrally located off Hwy 65 in Ham Lake, MN. Our storage property is easily accessible from local roads and highways. Unlike some storage properties, you will find North Metro Storage to be highly visible. Our convenient location and flexible hours allow you to come and go smoothly. North Metro Storage is a state-of-the-art property offering a variety of storage options at great rates. We pride ourselves for our focus on customer service and ensuring your storage experience is as smooth as possible. Contact one of our team members today for all your storage needs!